For those who simply love to love movies. As I mentioned on Friday, we lost an amazing actress recently, Jean Simmons. And so I thought I would talk about my favorite movie of hers this week, "Young Bess" (1953). Most people I talk to have never heard of this movie. Heck, most people think I'm talking about the KISS guy whenever I mention Jean Simmons. But this film is a fun treasure that I feel everyone should check out sometime. Superbly acted, it tells the story of young Elizabeth I before she became the powerful queen we know. Ms. Simmons plays Elizabeth (a much prettier Elizabeth than history tells us, but, hey, it's Hollywood) and her husband at the time Stewart Granger plays her love interest Thomas Seymour. 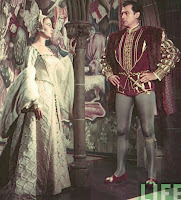 Deborah Kerr also stars as Catherine Parr, the last of Henry VIII's wives, and Charles Laughton plays the infamous monarch again, 20 years after playing him in "The Private Life of Henry VIII." Released the same week as Elizabeth II's coronation in 1953, this movie was part of the whole world's immense fascination at the time with all monarchs named Elizabeth. Based on Margaret Irwin's novel of the same name, the historical accuracy of this story leaves something to be desired though. In the screenplay, Elizabeth, having been bounced around from banished to favored and back again after the execution of her mother Anne Boleyn, falls for the kindness of Thomas Seymour, even though he is already in love with Catherine Parr. In reality, it was Seymour who made advances on Elizabeth, who consequently rejected him. (She said when he died, "Today died a man of much wit and very little judgment.") That's just one example of the inaccuracy, but this story is still great fun to watch - 50s Hollywood in all its glory and glam. I first discovered this film when I was a kid because of my own fascination with Elizabeth I, whom I had just started learning about in school, and also because of one man - Stewart Granger! (*sigh*) I had a HUGE crush on him as a little girl and scoured the television channels and video store to watch every movie I could find of his. (And yes, I still swoon when I see his films today.) He and Jean had been married for 3 years when they made "Young Bess." They had just won a huge battle against the eccentric mogul Howard Hughes. When they moved to America in 1950, they were not married yet. But Hughes helped them out, and let them marry at his place in Arizona. Unfortunately, he became obsessed with Simmons, and bought out her contract to J. Arthur Rank, the British producer to whom she was still connected. When she refused to sign a new 7-year contract with Hughes and his company RKO, he proceeded to destroy her career, putting her in horrid films for the remainder of her existing contract. Simmons and Granger finally managed to win their lawsuit with Hughes out of court, and Simmons regained control of her career. And thank goodness she did! Otherwise we wouldn't have been able to enjoy her in films like "Guys and Dolls," "Big Country," or "Elmer Gantry." I had the great pleasure of meeting Ms. Simmons on one of her later gigs. She was working on the English dubbing of Miyazaki's "Howl's Moving Castle," and a friend of mine, knowing I was a fan, asked if I'd like to watch her work. I jumped at the chance, and it is one of my most enjoyable memories of living here in Los Angeles. Too nervous to say hello, she noticed me sheepishly watching her with a huge, dorky smile on my face. Finally, during a break, I got up the nerve and went to say hello. She was an absolute delight to talk to, especially after I mentioned that I was the fan, not my mother or grandmother. When I said goodbye, she hugged me, and I went away happy as a clam that I had finally met one of my idols. Unfortunately, "Young Bess" is not on DVD yet, but you can catch it on YouTube. Also, TCM plays it pretty regularly, so keep an eye out there (as I will do as well for you). You will be happily pleased, I am sure of it. Movie fanatic, craft enthusiast, artist, writer, cat lover, fiancé, and karaoke participant.